A pleasant little agricultural town, nestled in the Usk valley and encircled by spectacular hills and mountains. Due to its prime location on the eastern edge of the Beacons, it is an ideal centre for exploring the Brecon Beacons National Park and the Welsh valleys that run up into the Black Mountains. The town centre is a labyrinth of narrow streets and alleyways, spreading out from the foot of its Norman Castle, on castle hill. At the heart of the town is a long shopping street filled with interesting little shops and antique dealers. The neo-Gothic market hall dominates the centre of the old town, where you will find a few Tudor houses and other interesting buildings, including Abergavenny's distinctive town hall. Abergavenny is a very ancient settlement. The Romans built a fort here in AD75-80. The town museum, located within the ruins of the medieval castle, traces the town's history from Roman times to present day. St Mary's Church, in Monk Street, was originally the chapel of an 11th-c Benedictine priory. It has interesting effigy tombs dating from the 13th to 17th-c, plus intricately carved 15th-c choir stalls. Of the other priory buildings, only the Prior's House and tithe barn still remain. Just one mile south of the town, at Llanfoist, is the idyllic Monmouthshire and Brecon Canal. For superb views over the Brecon Beacons, energetic visitors can climb nearby Ysgyryd Fawr (also known as The Skirrid or Holy Mountain), which rises to 1595 ft (486 m) on the eastern edge of the Black Mountains. 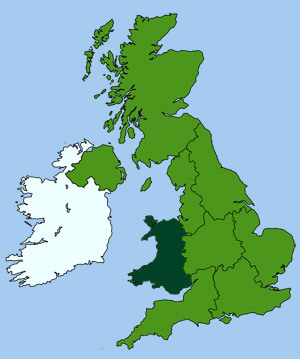 Also the drive north from Abergavenny to Hay-on-Wye, is one of Wales's most scenic drives. 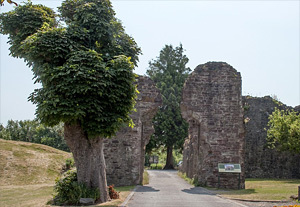 Abergavenny's Norman castle was founded in 1090 by Hamelin de Balun. It was destroyed during the civil war and all that remains today are a few remnants of the outer wall and a ruined gatehouse, set in a pleasantly wooded park. The castle keep was rebuilt in the early 19th-c as a hunting lodge and now houses the town museum. The castle was the scene of a notorious massacre in 1175, when William de Braose invited the local chieftains to a festive meal in the great hall, during which he had them all murdered. The museum, located in a 19th-c hunting lodge within the grounds of the castle, traces the town's social and economic history. Exhibits include local archaeological finds, vintage agricultural tools, domestic artifacts, traditional Welsh costumes and harps.